Defense officials plan to order four or five Iron Dome systems. Obama has asked Congress to approve $205 million in aid. "Iron Dome," Israel's new rocket defense system, was deployed and displayed for the first time Sunday morning near Be'er Sheva. The system was to become be fully functional in the course of the day. 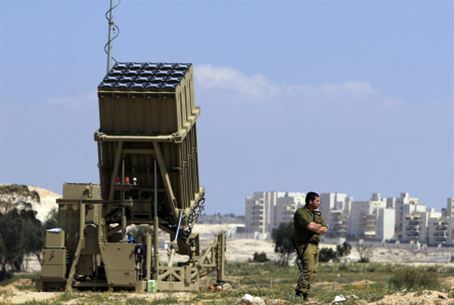 Defense officials plan to order four or five Iron Dome systems. United States President Barack Obama has asked Congress to approve $205 million in aid for the project. The Defense Ministry has touted Iron Dome as a solution to terrorist attacks from Gaza. However, the system can only successfully target rockets with a flight time of approximately 15 seconds or more, while Gaza terrorists can hit Israeli communities that are close to them with rockets that have a shorter flight time. In addition, each Iron Dome missile costs approximately $100,000, far more than the average short-range Kassam rocket preferred by Gaza terrorists. Critics of the system say that this would enable terrorists to hurt Israel financially by launching as many rockets as possible.